Hello, I have a few questions about the summer dress. are the pants supposed to end at the hips, not the waist? I’ve tried the pants and apparently they ended very close under my breasts, is that too high to wear…? How low should it go. Do the normal pants ‘standard’ remain the same (Must end at 3rd boot lacehole, etc.)? Is there a possibility to exchange the pants for a bit smaller fitting ones. Erm, can I just ask which Cadet Force you are in exactly? Your use of the word ‘pants’ in this context suggests a North American speaker, this is primarily a forum for the UK based Air Cadets, so we may struggle to help you. I think they are canadian. We used to have a canadian forum member but don’t think they’ve posted for a long time. I would speak to the staff at your unit as they will be able to help you more than we can. Ah, yeah, what PeP said, sorry we can’t be of much help. Still nice to see an international Air Cadet. Welcome! Perhaps make an “international exchange” section? 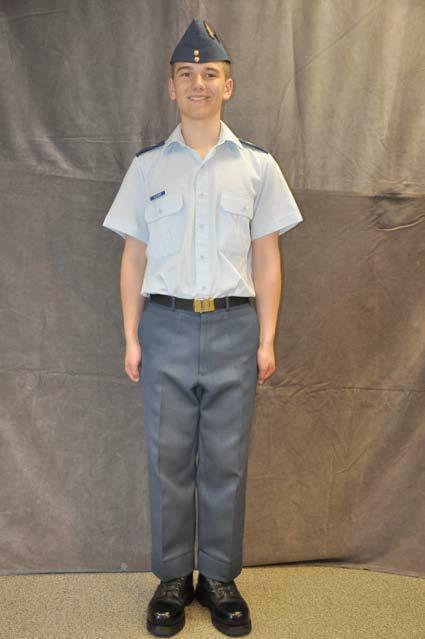 (Obviously a male rather than female Air Cadet, but you get the general intention for pants/trousers fit). The way the hem of the trouser-leg should sit showing the same number of boot-lace holes as normal (ie three). It’s possible that your pants are slightly too large a size for you, just by description. Ask advice from your flight’s Cadet NCOs or, if you’ve a squadron Civilian Instructor that looks after stores, they should be able to help. It’s a long time since I was last in Canada, but I try to keep up-to-date with what’s going on in the RCAirCadets, the League and also the RCAF. Good luck with your Cadet career, and I hope you enjoy camp this summer if you’ve got a place.